A year before we moved to New Mexico, my partner Kevin visited Denver and brought me back a t-shirt from Rockmount Ranch Wear. It featured a bucking bronco and read “Styled in the West by Westerners.” You could say it stood out from the other t-shirts in my urbanite’s closet. He got himself a vintage Western shirt with saddle stitching, sawtooth pockets and white pearly snaps, which reminded me of something an Austin hipster might wear. Very retro. Very now. At the time, I had never heard of Rockmount, nor did I know how many celebrities wear it. But when we drove up to Denver earlier this summer, I got a chance to find out what all the fuss is about. Turns out Rockmount is something of a legend – as was its recently deceased Founder and CEO, Jack A. Weil, who ran the company until his death in 2008 at age 107. 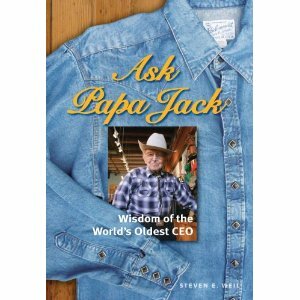 His book, Ask Papa Jack: Wisdom of the World’s Oldest CEO, dispenses his famously opinionated lessons. I knew I liked the guy when I flipped through his book at the Rockmount headquarters in Denver’s historic LODO (lower downtown) district – where gold was first discovered, industrial warehouses later sprung up, and more recently, trendy stores, clubs and restaurants have proliferated – and landed on a page where he was bashing Sam Walton, Wal-Mart's founder. “Sam Walton was nothing but a hillbilly." Weil’s disdain may in part be personal – they were acquainted – but also professional. Rockmount refuses to sell to chains or discounters like Wal-Mart, and in fact, Weil felt those very outlets were responsible for ending clothing manufacturing in America. He may be right given that Rockmount’s historic five-story building (built 1908) in LODO is the only clothing manufacturer remaining in the area. Rockmount’s finely tailored shirts, skirts, ties, scarves and more are still made mostly in the US. Accordingly, they’re not cheap – around $70-$90 a shirt. But as Kevin says, they’ll last forever. You can find more modern “relaxed wear” Western styles, and you can also find vintage fitted designs from the 40s, 50s and other eras, including "high wattage" shirts with hand chenille embroidery, fringes and rhinestones. The original bling. Recognize these two? A trailblazer as well as a holdout, Rockmount introduced the sawtooth pocket and was the first to add snaps to Western shirts, now a common practice and part of the rockabilly aesthetic. The reasons were quite simple. 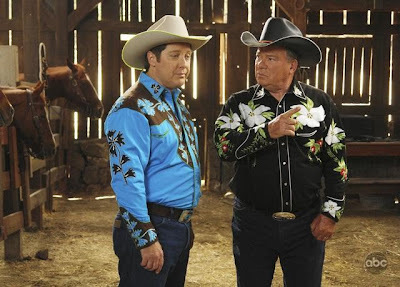 Buttons come off, cowboys don’t like to sew, and it’s easier to wiggle out of a shirt with snaps if you get caught or snagged out on the range. And that’s the Western state of mind, folks.